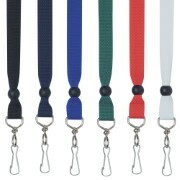 Unprinted 15mm ribbon lanyard with metal J-hook clip. We would love to help you with a custom quote. Mention NOTTAGE-2450WH. Just call 1800 674 722 or get a custom quote.